Last tutorial post, guys! 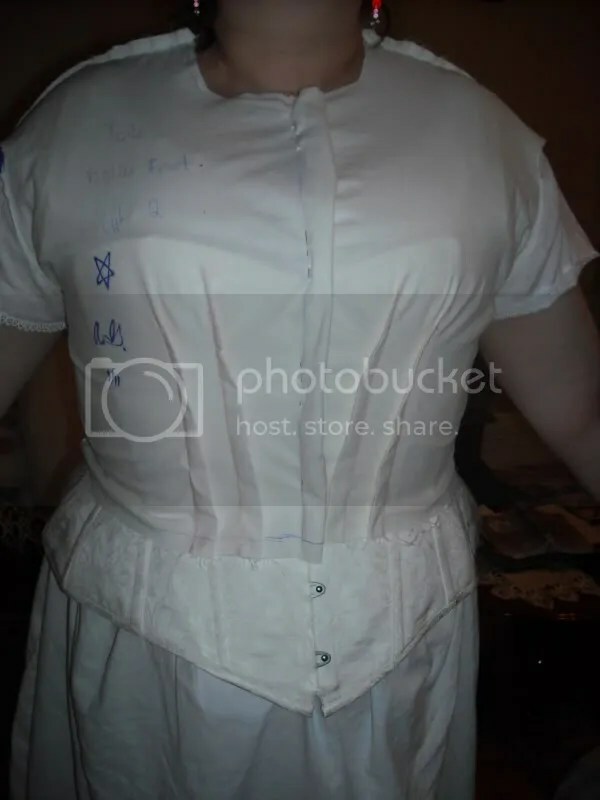 Today, we’re gonna make a mock-up of the toile and if all goes according to plan, you’ll have a perfectly fitted bodice that you can use and manipulate to make an infinite variety of mid 19th century bodices. So, how do we do that? Well, first we have to get the toile off of the body. Starting in the front, carefully remove the pins from the center front in the corset. After these are gone, remove the pins in the back. 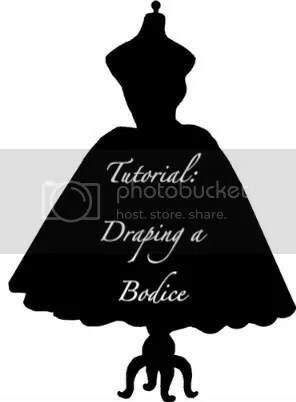 Gently slide the toile off of the shoulder, being careful not to pull or snag anything. Remember those period seams that we drew along the shoulder and side seam lines? Well, using a scissors, cut along both of these lines. You should now have a back and front piece ready to have the lines smoothed out. It’s a good idea to do this next process on muslin because then you can easily cut out the mock-up, baste it together, and test the fit. With that in mind, start with a piece of muslin folded in half. Place the back part of the bodice on this piece of muslin, aligning the center back with the fold of the muslin. Use pins or pattern weights to attach the draped toile to the muslin and then trace the outline of this using a pen. Remove the draped back bodice from the muslin and using a hem gauge or a ruler, draw the seam allowances in. Draw in 1/2″ seam allowances at the side, shoulder, waist, and armscye seams and 1/4″ seam allowance along the neckline edge. 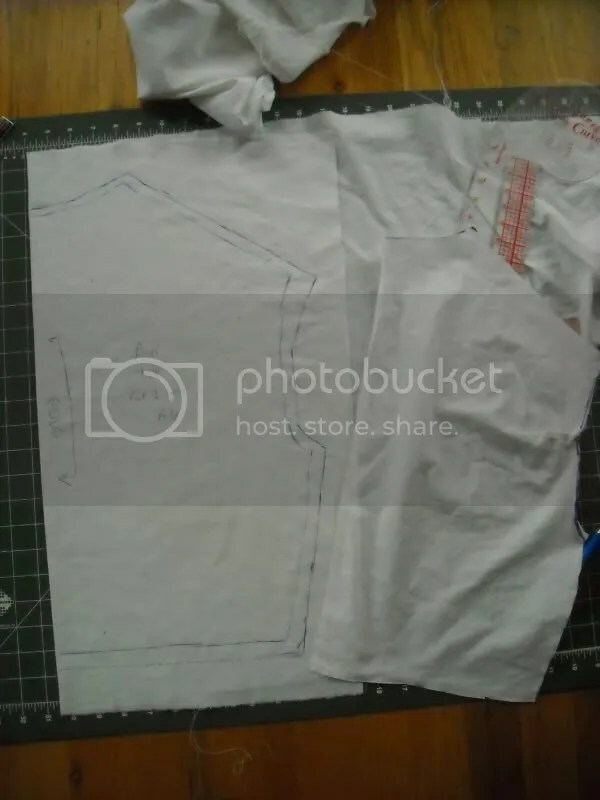 If you are particularily worried about your toile fitting, it’s a good idea to draw in 1″ seam allowances as this will give you leeway to take in or out the seams as need be. Cut out this piece and set it aside for now. Next, we’re gonna work on the front of the bodice. Fold a piece of muslin in half, and using pattern weights or pins, attach the draped bodice front to the muslin. It is critically important that you smooth the fabric upward and trace along the cut line of the period-marked shoulder and side seam. You’ll have some extra bulk from the pins that are holding together the natural seams, so just smooth this out as if they were a sewn seam. Using a pen, once again trace around this piece of muslin. On the darts, smooth out the lines with your pen and then using a tracing wheel and tracing paper, transfer the dart markings to the muslin. Add 1/2″ seam allowance to the side, shoulder, waist and armscye seams, and 1/4″ seam allowance to the neckline seam. From the center front of the muslin, mark a placket about 1 1/2″ giving you enough room for a turnback and space to sew hooks and eyes on to. Your finished drawn muslin should look like this. Note how the natural shoulder and side seam lines are still pinned, but it is the period shoulder and side seam lines that we have traced around. Remove the weights or pins and cut out the two bodice fronts. Now, we’re finally ready to test the fit of the muslin. Sew the darts on both front bodice pieces. Press darts towards center front. Next, sew the back bodice muslin to the front at the shoulder and side seams. Press seams to the side or open. Put the mock-up on the drape-ee inside-out, with the seams showing on the outside. Pin the toile closed at the center front and check your work. You can always pinch in extra fullness, or adjust the placket as need be. I’ve had armsyce issues, too, so you can always adjust that, as well. 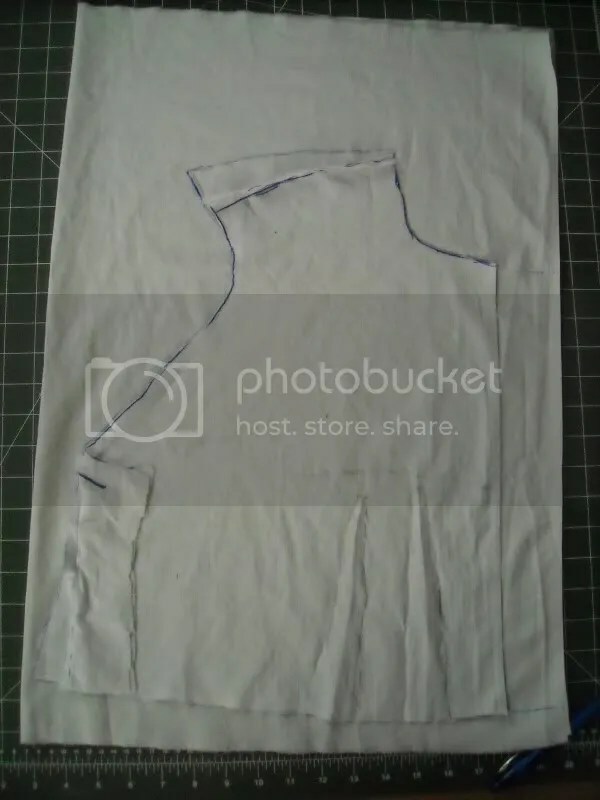 With your bodice now fit, take apart this muslin mock-up and use it as your toile OR trace this mock-up onto butcher or blank paper as your permanent paper pattern. Make sure that you mark on the pattern which pieces are which, the placement of the darts, and that the center back is cut on a fold. And, that’s all their is to draping a bodice! Time consuming, yes, but difficult? Nah! Finally, huge kudos need to be given to Barbara “Auntie B” Smith of The Sewing Academy who graciously agreed to model for the photos in the toile-draping tutorial. She also gave me the idea to write a tutorial about it (something I didn’t think I could do!) so big thanks for that, as well. So, go forth and drape lovely toiles and have lovely fitted bodices. If you have any questions, you can always leave a comment or shoot me an e-mail!